Daisy loves the Lifestylist® philosophy of Life Celebrating Style. She is also open to any excuse to wear her favorite hats and attract attention. 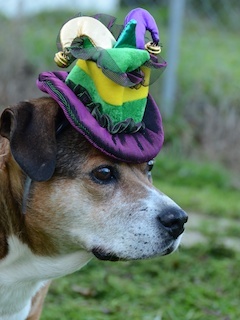 Mardi Gras Greetings from Daisy the diva dog and the Lifestylist® family! We just got back from The International Builders Show and there were so many great things to see and do it's going to take me weeks to catch up! I like having those types of problems though, and after attending the show and having the rare opportunity to hear Ben Bernanke speak about true solutions that can help the building industry, I'm optimistic about what lies ahead. One of my favorite seminars this year was hosted by the NAHB 20 Club Program which I think is one of the most important groups in the NAHB. Twenty non-competitive builders make up a group that gets together a few times a year to be open about their different business practices and share their successes and opportunities. Thermador is a major sponsor of this group and their participation has helped to make this program a vital resource for builders. They have made their amazing culinary center available for the 20 Club meetings and have been very supportive in every way possible. David Riedman - President of Riedman Development and @home Builders has been a member of one of these groups for years, and he has always raved about how important they have been to the growth of his company. He was gracious enough to take time out of his very hectic schedule and share how this group has helped him. He was joined by three other panelists that are also very active, and are very successful in spite of the housing downturn. I think that says a lot for the value of these groups. Being involved in his local Home Builders Association (he is a past president), the 20 Club and now having more of a national presence is one of the reasons @home Builders is so respected in the Rochester and Western New York housing markets. We are so proud of this growing company - Lifestylist® Design as been merchandising their model homes, apartment clubhouses and corporate apartments for over 15 years and it has been a delight to share in their successes. If you would like to obtain a copy of his speech and find out more about the 20 Club program, it is available on MobilTape here. What a great, busy month this has been! This Lifestylist® has show houses to plan, new products to design and great conventions to attend... there just aren't enough hours in the day for all of the great opportunities that are ahead of us! Last week I attended the International Builders Show in Orlando and after attending this convention for over 20 years I think this year was one of my favorites. I am so proud to be a part of the National Association of Home Builders and to be involved in the modular side of home building. This was the year when I saw home builders really taking notice of what benefits factory built construction could offer them, and not only did we do a great job of talking about it - we also showed them. There are meetings that go on before the Builders Show starts that help put in place best practices to promote and grow the housing industry. Councils cover various specialty groups, and I was impressed to see that Kevin Flaherty, Vice President of Marketing for Champion Homes was not only attending these meetings, he is also acting as Vice Chairman for the Building Systems Council. "The New Champion" is really showing their strength and commitment to the factory built housing industry, and not only are they active with NAHB, they are also becoming more active with the Manufactured Housing Institute. Kevin was a presenter in the NAHB News Conference "Industry Study: Characteristics of Modular Homes" and had great facts and figures about why consumers should consider buying a modular home. Palm Harbor Homes presented three beautiful factory built homes in the Professional Builder Show Village showing a "Net Zero Eco-Home" that was a 399 sq. ft. park model, a modular duplex, and a modular luxury home. Tony Lucas the designer for Palm Harbor always does an outstanding job, but what he did with the Net Zero home really got people's attention. Tony added the architectural details on the exteriors that made you want to know and see more which is a lot of what you want a show home to do. It was interesting because another builder brought a home for the first time and it was in neutral colors and without much exterior interest, and many people (including myself) passed it by. I heard the home was beautiful inside, but only found that out after the show was over. Builders were fascinated by the fact that the three homes were installed, furnished and decors added in 8 days. This was proof of one of the many benefits that factory built housing offers - time savings which results in cost savings. Will these homes result in sales for Palm Harbor? Ron Powell, President of Manufacturing for Palm Harbor Homes stated that "I haven't seen the statistics, but our internal feeling is that attendance at Show Village was better than last year. There were more attendees with solid projects in the immediate future. In the last few years, there were a lot of attendees trying to flesh-out ideas. This year, they've got land and are ready to go." 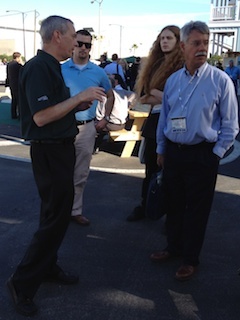 Besides having market driven homes at the show, I was also impressed to see Joe Stegmayer - the Chairman of the Board, President and Chief Executive Officer of Cavco Industries, a director and officer of Fleetwood Homes, Inc. and Palm Harbor Homes, Inc. ,and a director of Palm Harbor Villages, Inc working the show. How he has time to even attend something like this is amazing, and I said working not attending the show because every time I saw him he was helping a potential customer or answering questions. And in his "spare" time he is serving as the Chairman of the Board for The Manufactured Housing Institute. His hands on approach to the factory built housing industry is one of the reasons it will continue to be a force to be reckoned with. One of the highlights of this year's show for me was getting to hear Ben Bernanke speak about the state of our economy and what's ahead for housing. More on that later, but to see more images from this year's International Builders Show, visit and "like" our Facebook page at: www.facebook.com/lifestylelist. I took over 2,000 photographs and I'm anxious to share my favorites with you. If you have never heard of Faith Popcorn, you've been missing out. This Futurist and head of Faith Popcorn's BrainReserve seems to always know what we want in our lives even before we do! "Eveolution" changed the way companies market to women, and her prediction about people "cocooning" was exactly what ended up happening. 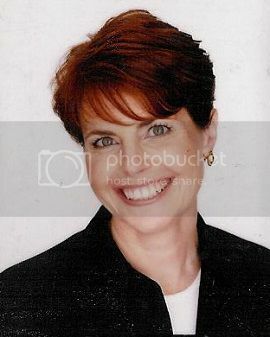 Faith just released her 2012 predictions in her What's Popping newsletter that you can download here. In it she sees a pervasive revolution coming that she calls SHE-CHANGE. As always, it makes sense. With single motherhood now sometimes being considered as a conscious lifestyle decision, and more women receiving their Master's degrees than men, we need to really re-think our marketing approaches.